Fans stayed on their feet for this hometown showdown. With the taste of last season’s powerful win still on their tongues, the Demon’s came wanting more, but the Stix put up a venemous fight, proving they were not so easy to take down. Lead changes were regular, and every push the Demons gave, the Stix answered back, keeping the score to a close 112 – Demons, 103 – Stix at the half. The second half was just as exciting as the first, and it was obvious both of these hometeams came to win. There were lead changes and star passes, big hits and fancy feet. Defense on both sides was fierce. 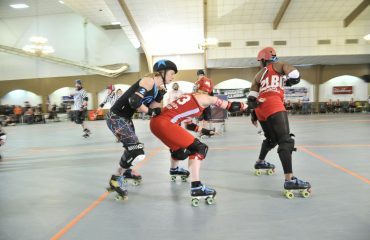 Each jammer had to fight, push and juke their way through rock hard walls, only to be faced with blockers recycling them back into the pack almost every turn. In the last minutes, the Stix were up, and victory was in their grasps, until All Star blocker Queen Loseyateefa did was she does best, and drew a cut track penalty on the Stix’s jammer. Even though the Stix fought to the bitter end, with The Boss sneaking their last four points in at the final whistle, jammer penalties were the Stix’s downfall, and the Demons came through for the win with an official final score of Demons – 224, Stix – 184.